As telemarketers, you thrive on the telephone. To do your job well, you need to make many calls. You need your calling campaigns planned down to a science. Effective call monitoring, recording and tracking means success in this industry. Now with Nectar Desk’s call center software, you can be sure of success. Nectar Desk’s computer telephony integration technology will give you the call monitoring and recording you need to keep record of your telemarketing calls. This way, your staff will know what works and what doesn’t. All of your call detail records are easily retrievable. Not one piece of information will be lost. Nectar Desk’s technology doesn’t stop there. With its interactive analytics dashboards, you can receive valuable insights into your telemarketing call activity. Now you can truly get your calling campaigns and staffing down to a science. 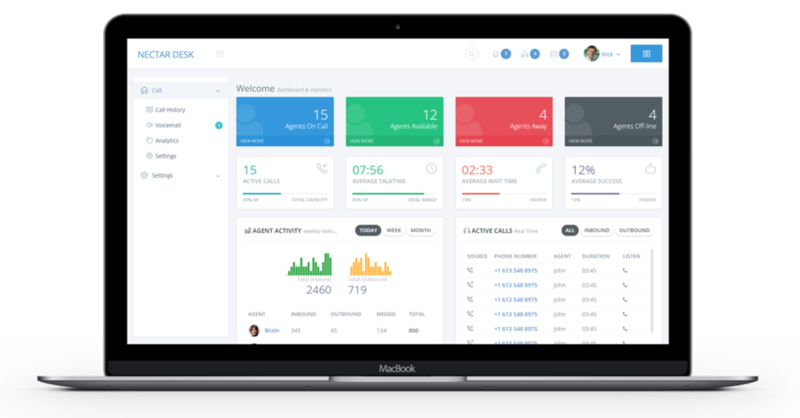 Nectar Desk’s analytics will take your telemarketing business to the next level. Telemarketing has never been more effective than with Nectar Desk.